There are quite a few different scenarios for when cache transforms can be used to improve usability and performance inside SSIS. In this post I am going to quickly outline a scenario where cache connection managers can greatly improve performance when loading a fact table. 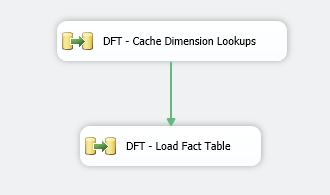 During the pre-execution phase of package execution SSIS “caches” the lookups inside your package into memory, unfortunately if you are using OLE DB connections in your Data Flow Task this caching happens in a serialized format (one after the other). Typically this isn’t a big deal because you may only have one or two large dimension lookups and all others are very small in size and very fast. But what if this isn’t the case? What if you have 5, 6, 7, or more dimensions all with millions of records that you must cache before the package begins execution? Here is how we can get around this little issue. Inside the data flow tasks we will set each source to point to our cache transforms. Each one of the Cache Transforms will require a connection manager to store the data. 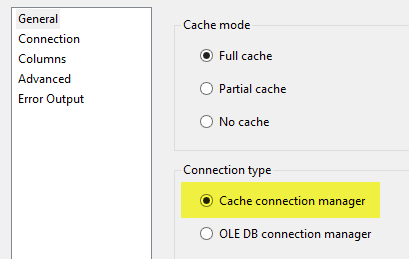 Now that the cache connection managers have been set up, you will need to point each of your lookup transforms to the “Cache Connection manager” instead of the default of OLE DB connection manager. All other configuration steps are the same as normal. Thanks for looking, and hope this helped.